Work through this interactive list and check off what you expose your dog to as you explore the world together. Introducing your pup to the items in the list will help them learn that new people, different sounds and textures, and being handled are all things to not be worried about! Scroll down or click here to access the checklist. These items in the list are suggestions — you should add your own and tailor the list to your everyday surroundings. To help you, especially with sounds like thunder and babies crying, we've put together a resources list of free videos and sounds to help your socialization and desensitization efforts. "Low and slow, short and sweet" is the best way to condition your dog to new things. Go slow and always give your dog the choice to walk away and add more distance from something if they show caution or fear. Pair these different experiences with things your dog loves, from high-value treats to praise and petting, or even playing with a favorite toy. Introducing Sounds: Start playing new sounds at a very low volume and make sure your dog has positive experiences while the sound plays in the background — interactive toys and puzzles, short positive reinforcement training sessions, playing with a favorite tug toy, a snuggle session or tummy rub, or a stuffed Kong are all great options! As they become habituated to the sound at a low volume, slowly raise the volume over time. Introducing Items/People: When introducing your puppy to different items or people, manage their distance from the item to make sure they stay comfortable and relaxed. Start with giving them a treat just for just looking at the new person or thing, then move on to giving them a treat for getting closer or interacting with it. You don't want to bombard them with too much interaction too fast, as this can result in stress and anxiety due to overstimulation. For example, introduce your puppy to one dog-savvy child at a time rather than a larger group of children at once. Being surrounded by a new type of person can overwhelm your puppy rather quickly and create a negative association. "Loved it!" indicates that your puppy enjoyed the interaction, showed happy, and/or calm and relaxed body language, and would happily continue the interaction if allowed. For exposure to different sounds, "Loved it!" means that your dog doesn't startle or otherwise react to the noise with barking or stress signals, meaning they have become habituated to it. "Meh!" indicates that your puppy either didn't seem to care much about the interaction, or wasn't totally sure about it. You might notice some stress signals (such as yawning, lip licking, or submissive body posture) but they're still cautiously interested in approaching or interacting. You can work on moving from Meh! to Loved it! by adding some distance from the item/person and pairing with things your dog loves for a while, before slowly moving closer (or increasing the volume of sounds) as your puppy gets more comfortable. "Hated it!" indicates that your puppy did not enjoy the experience at all. They exhibited fear and stress signals, flight or fight responses (trying to run away, hiding, growling, barking, snarling, or biting). Do not expose your puppy to that item or experience again without proper management and support. You will need to use what is called "counter conditioning" for that particular list item and we suggest connecting with a certified positive reinforcement trainer to help you with the counter conditioning process. If you want to learn more about how to evaluate your dog's body language, check out some great resources available at our Decoding Canine Body Language Resource Page. At the top of the interactive checklist you can see how many items you've checked off and how many items are in the "Meh!" and 'Hated it!" 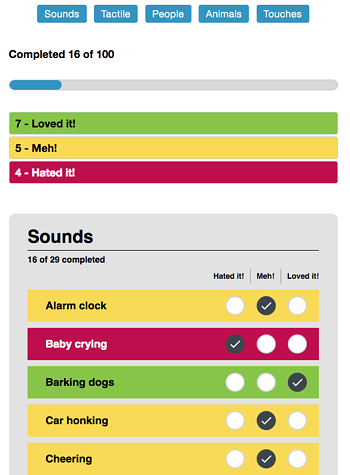 categories so you know what you'll need to work on with your puppy. Keep this tab open on your desktop or phone* so it's handy when you need it! And print a copy out to post in your home so everyone can update as you go. Printer-friendly version. *Your selections will be saved as long as you do not clear your browser's cache. Visit our Puppy Socialization Resource Page for videos of sounds for your puppy to listen to, smartphone app resources, and how-to videos on how to properly use conditioning and counter conditioning techniques.